The tagline for the Atom text editor is “A hackable text editor for the 21st Century”. As a Haack, this is a goal I can get behind. I thought I’d put this to the test by building a simple extension for Atom. I decided to port the Encourage extension for Visual Studio I wrote a while back. For a lot of developers, this image rings true every day. Who needs that negativity?! 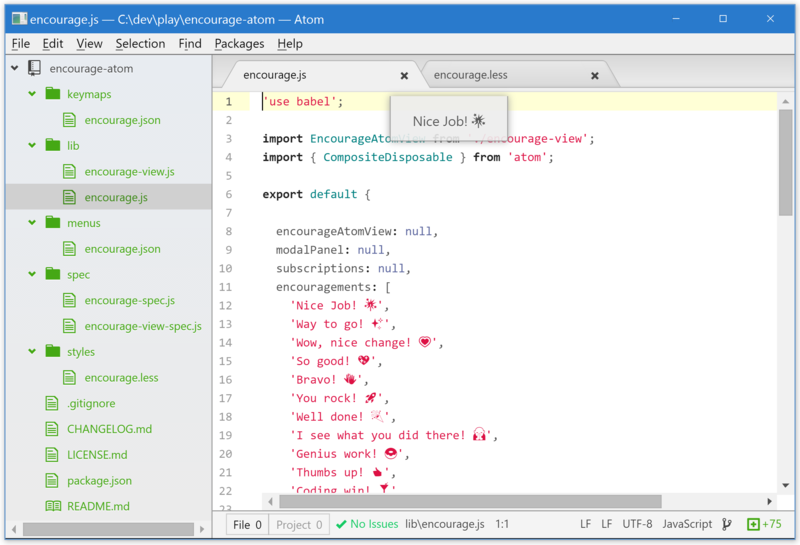 The Encourage extension for Atom displays a small bit of encouragement (“Way to go!”, “You rock!”, “People like you!”) every time you save your document. Maybe it’s true that nobody loves you, but your editor will, if you let it. The Atom Flight Manual has a great guide to creating and publishing an Atom package. The guide walks through using an Atom package that generates a simple package you can use as a starting point for your own package. I won’t go into every detail about the package. You can see the code on GitHub yourself. I’ll just highlight a few gotchas I encountered. By default, the “Generate Package” command creates a package that is activated via a command. Until you invoke the command, the package isn’t activated. This confused me for a while because I wanted my package to be active when Atom starts up since it passively listens for the onDidSave event. The trick here is to simply remove the activationCommands section from the package.json file. Then, the activation happens when the package is loaded. Many thanks to @binarymuse for that tip! When you make changes to your extension, you can reload Atom by invoking CTRL + ALT + R. That’ll save you from closing and reopening Atom all the time. You can invoke the Developer Tools with the CTRL + ALT + I shortcut (similar to CTRL + SHIFT + I for Google Chrome). That’ll allow you to step through the package code with the debugger. Be sure to check out the Atom API documentation for details about the extensibility points provided by Atom. One of the challenges with Atom is there are so many different ways to extend it it’s hard to know what the best approach is. Over time, I hope we start to gather these best practices. Maybe there’s a better way, but I love that I had the ability to get this to work. I’ll iterate on the package over time and make it better. By default, the extension comes with a few specs. You can run the specs by invoking CTRL + ALT + P. I set up continuous integration (CI) for the package with AppVeyor by following these helpful instructions. I had continuous integration up and running in the matter of minutes. Publishing an Atom package is super easy. Push your code to a public GitHub repository and then from the repository directory call apm publish patch|minor|major depending on the type of change. The flight manual I mentioned has details on this command. I don’t plan on investing a huge amount of time in this extension. It was more an exercise for me to learn about the Atom packaging system. If you’re interested in helping out, I’ve already started logging issues such as being able to set the list of encouragements. I’d welcome the help! For example, I want to add the ability for those who use the package to set up their own encouragements. Or perhaps, discouragements. 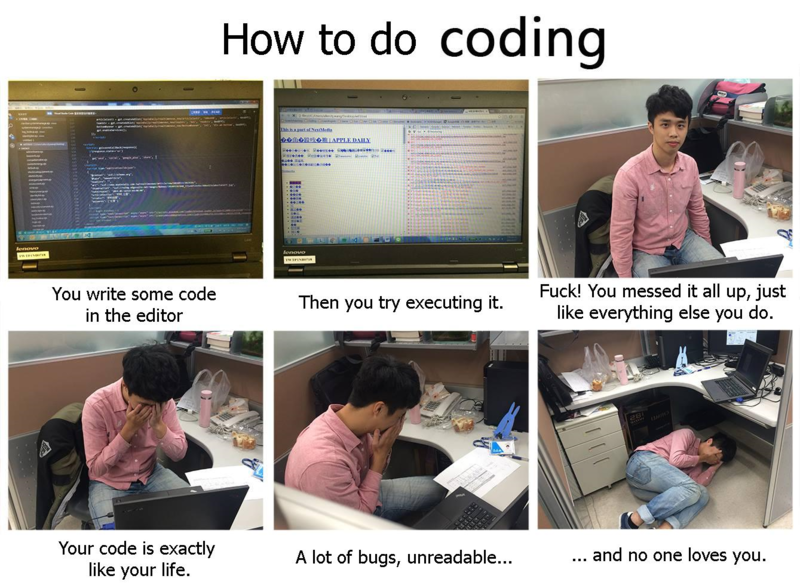 I actually find it really funny when my editor shits on my code. In fact, it causes me to think harder about my code because I want to prove it wrong. I should probably stop with all this editor anthropomorphism, huh? Tell me what you think in the comments. UPDATE: A couple days after publishing this package, Nathan Armstrong (aka armstnp on GitHub) sent me a pull request that implemented the ability to configure the list of encouragements via the Package Settings (Thanks!). This has been published in Encourage v0.2.0. To set this, go to the Settings view, select the Packages tab, and find “encourage” under the Installed Packages section. Then can click the Settings button for the package and update the comma separated list of encouragements. UPDATE 2: There’s a port for VS Code users now! I love Atom!!! I'm trying to convert everyone! I'm also an Evangelist for your ConzoleZ post. Great stuff! I've been reading forever, thanks for everything! Great post, could be useful when writing a custom package.